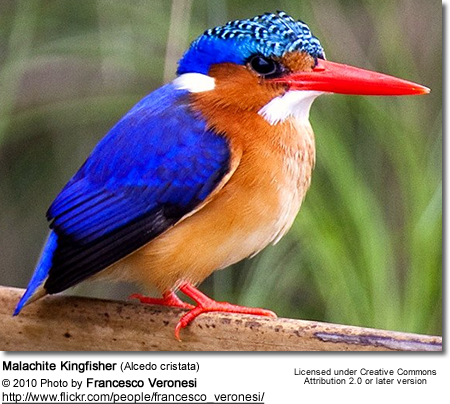 The river kingfishers or Alcedinidae, are one of the three families of bird in the kingfisher group. 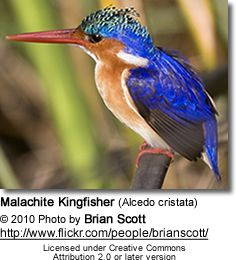 The Alcedinidae once included all kingfishers, before the widespread recognition of Halcyonidae (tree-kingfishers) and Cerylidae (water-kingfishers). The family is widespread through Africa, through east and south Asia as far as Australia, with one species, the Common Kingfisher (Alcedo atthis) also appearing in Europe and northern Asia. The origin of the family is thought to have been in Asia. These are brightly plumaged compact birds with short tails, large heads and long bills. They feed on insects or fish, and lay white eggs in a self-excavated burrow. Both adults incubate the eggs and feed the chicks. The river kingfishers family Alcedinidae is one of nine in the order Coraciiformes, which also includes the motmots, bee-eaters, todies, rollers, ground-rollers, Cuckoo Roller and two other families of kingfishers. The rollers do not appear to be particularly closely related to the others groups, and the Coraciiformes are therefore probably polyphyletic. 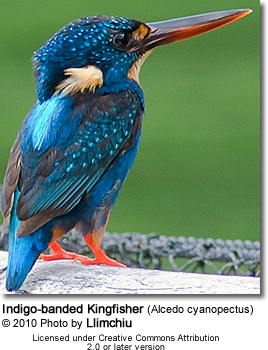 In the past, all kingfishers were placed in the Alcedinidae, but it became clear that the three subfamilies diverged early, and the Halcyonidae (tree kingfisher|tree kingfishers) and Cerylidae (water kingfishers) are usually now treated as full families, with the Alcedinidae being ancestral to the other groups. The taxonomy of the family is uncertain at present: it includes 22 to 24 species in two to four genera. The uncertainty arises from two small African species. 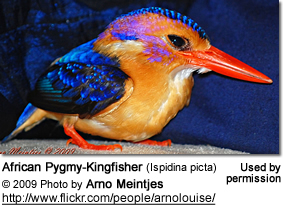 The African Dwarf Kingfisher is sometimes placed in the monospecific genus Myioceyx, and sometimes with the Pygmy Kingfishers in Ispidina. 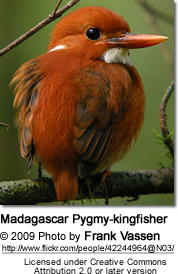 However, molecular analysis suggests that the Madagascar Pygmy Kingfisher is most closely related to the Malachite Kingfisher, and that the present arrangement into Alcedo and Ceyx may need to be reviewed as it seems not to reflect the actual relationships (for example, the Azure Kingfisher is closer to Ceyx erithacus). All kingfishers are short-tailed large-headed compact birds with long pointed bills. Like other Coraciiformes, they are brightly colored. Alcedo species typically have metallic blue upperparts and head, and orange or white underparts. 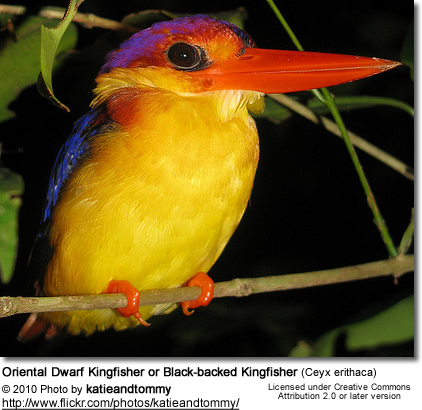 The sexes may be identical, as with Bismarck Kingfisher, but most species show some sexual dimorphism, ranging from a different bill colour as with Common Kingfisher to a completely different appearance. 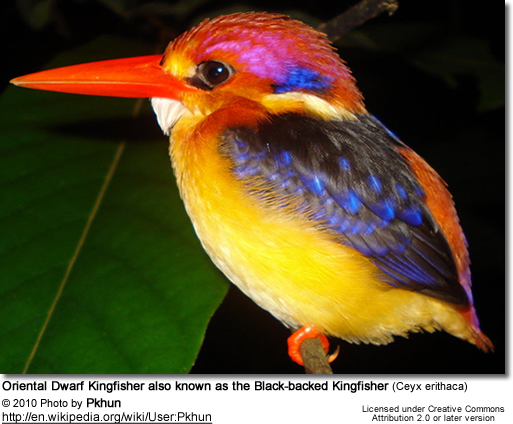 The male Blue-banded Kingfisher has white underparts with a blue breast band, whereas the female has orange underparts. The small kingfishers that make up the rest of the family have blue or orange upperparts and white or buff underparts, and show little sexual variation. Across the family, the bill colour is linked to diet. The insectivorous species have red bills, and the fish-eaters have black bills. When perched, kingfishers sit quite upright, and the flight is fast and direct. The call is typically a simple high-pitched squeak, often given in flight. Most alcedinids are found in the warm climates of Africa and southern and southeast Asia. Three species reach Australia, but only the Common Kingfisher is found across most of Europe and temperate Asia. No members of this family are found in the Americas, although the American green kingfishers are believed to have derived from alcedinid stock. The origin of the family is thought to have been in southern Asia, which still has the most species. The Ceyx and Ispidina species are mainly birds of wet rainforest or other woodland, and are not necessarily associated with water. The Alcedo kingfishers are usually closely associated with fresh water, often in open habitats although some are primarily forest birds. River kingfishers are monogamous and territorial. The pair excavates a burrow in an earth bank and lays two or more white eggs onto the bare surface. Both parents incubate the eggs and feed the chicks. Egg laying is staggered at one-day intervals so that if food is short only the older larger nestlings get fed. The chicks are naked, blind and helpless when they hatch, and stand on their heels, unlike any adult bird. The small Ceyx and Ispidina species feed mainly on insects and spiders, but also take tadpoles, frogs and mayfly nymphs from puddles. The will flycatch, and their bills are red bills are flattened to assist in the capture of insects. 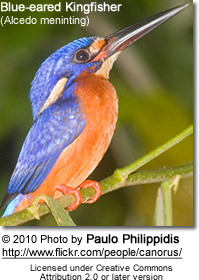 The Alcedo kingfishers are typically fish-eaters with black bills, but will also take aquatic invertebrates, spiders and lizards. A few species are mainly insectivorous and have red bills. Typically fish are caught by a dive into the water from a perch, although the kingfisher might hover briefly.